ET Fruit is Responsive Joomla! 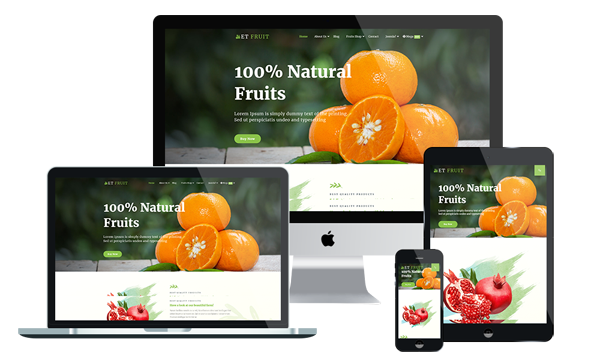 template that targets for fresh, canned, selling fruits or organic food website. This is the perfect solution when you are trying to answer possible clients’ request for natural, bio fruits. Easy to install and configure, our Organic Food Joomla! template will support your efforts as a small producer. By setting a gorgeous online theme, your products will definitely become popular among internet users. High-quality images presenting the items in detail, displayed in a modern slider using smooth visual effects. This helps to introduce the viewer directly to your offer and makes him or her feel like in an orchard. Using the Admin Panel, you can have complete control over everything that shows up on the front end of your website. Add, edit, or remove all kinds of content in a user-friendly interface so you can make updates on your site for as often as you need, changing what’s in your fruit basket as you want. You also get access to lots of high-quality stock photos of fruits and related images. Organic Food Joomla! template supports mobile devices with 100% responsive layout. It also builds with latest Bootstrap CSS Framework, Support Font Awesome, K2 extended style and J2Store. It comes with flexible homepage which drag-drop layout and full-width layout, strong shortcodes, unlimited module position, and has drag-drop tools and color settings helping to create unique websites with various layouts. Besides, it is also included 4 color schemes and boxed layout to make your template look more motivated and attractive. Be creative and don’t let your business get suffocated by bigger competitors! Implement the Organic Food Joomla! template that will help you sell more today!